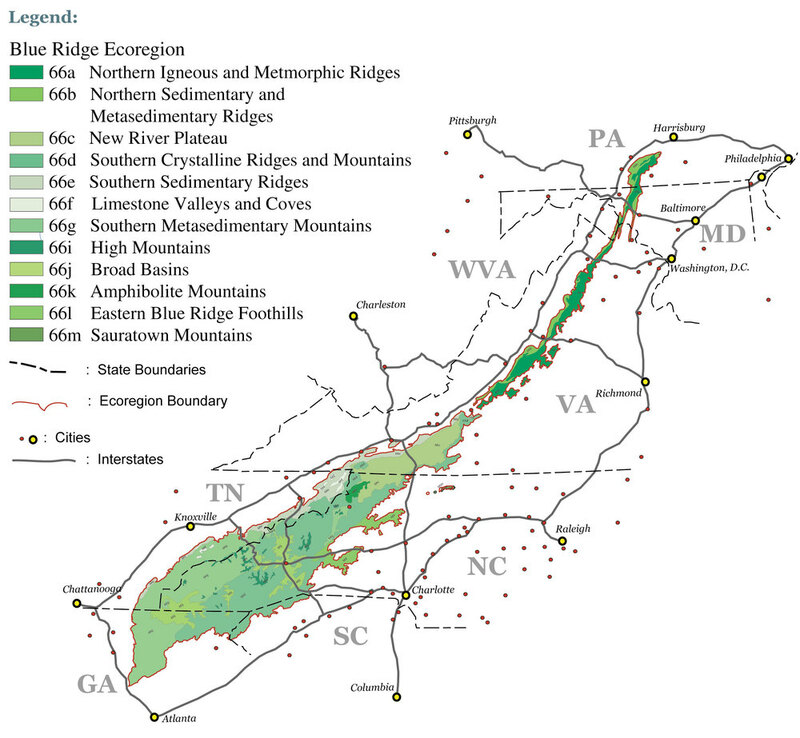 The Blue Ridge Ecoregion, as defined by the Omernik Ecoregion System of classification, extends from southern Pennsylvania to northern Georgia, and varies from narrow ridges to hilly plateaus to more massive mountainous areas, with 125 peaks reaching over 5000 feet. The mostly forested slopes, high-gradient, cool and clear streams, and rugged terrain occur primarily on metamorphic rocks with very few areas of igneous and sedimentary geology. The Blue Ridge is a province of the larger Appalachian Mountain chain and is defined on the east by a transition to Piedmont terrain and the west by its transition to the valley and ridge province. • The forests of the Southern Blue Ridge are the most ecologically rich in the temperate world - scientists estimate that 100,000 species exist in Great Smoky Mountains National Park alone. • There are over 4,000 known plant species in the Southern half of the Blue Ridge alone, 250 of which are found nowhere else in the world. • Spray cliffs, fens, bogs, seeps, glades, swamp-forest bog complexes, upland pools, and granite balds serve as important nodes of species diversity. • There are 34 known species of salamanders. The Mount Rogers area contains over 20 species, which is a diversity in Salamanders unmatched anywhere on earth in an area of that size. 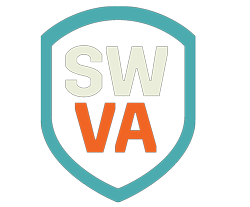 • Elevation ranges from 580 feet to 6,684 feet within the Blue Ridge Ecoregion. These extremes in altitude also enhance species diversity. It has been estimated that each 1,000 feet in elevation is accompanied by a 3.6-degree Fahrenheit decrease in temperature. • Over 400 endemic species have been identified in the Blue Ridge Ecoregion, more than any other ecoregion in North America. • The region’s streams and rivers contain the largest variety of fish, fresh-water mussels and crayfish in the temperate world. More than 230 fish species have been documented, and new species continue to be discovered. • The large and undisturbed tracts of land within the Blue Ridge provide habitat for a large number of rapidly declining neotropical migrant songbirds. It is here that they find refuge. • The Blue Ridge gives birth to what is regarded to be one of the oldest rivers in the world, the New River. Geologists believe that the river is older than the Blue Ridge Mountains themselves. 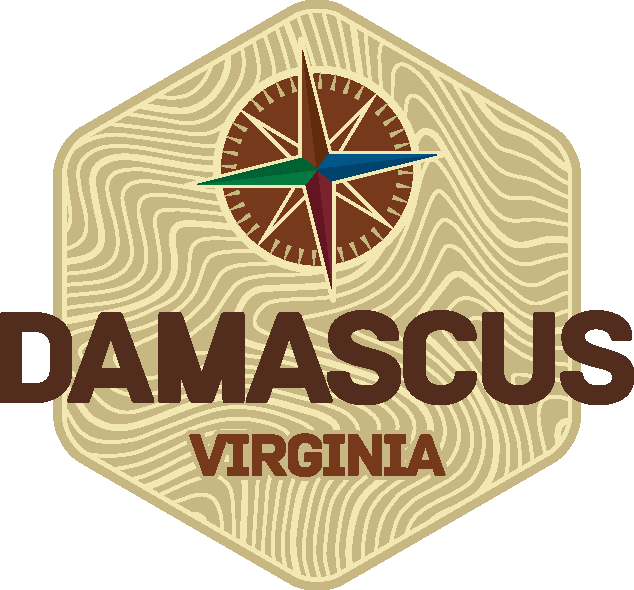 Why did we choose to focus on the Blue Ridge Ecoregion? Our interpretive approach is unique because it focuses on a single globally unique macro-habitat, the Blue Ridge Ecoregion. Our purpose is to further an understanding of the rich natural history of this Ecoregion. The beauty and the treasures of this region have the potential to inspire the world. A 6,000-foot increase in altitude is similar to driving 1,000 miles north. A trip from the James River, at an altitude of 650 feet, to the 5,729-foot summit of Mount Rogers in Virginia's southern Blue Ridge is the rough ecological equivalent of a drive from the James River to the shores of Canada's Hudson Bay. Depending on the route to Mount Rogers, the traveler would pass through a variety of forest communities. These might include a silty lower flood plain, wetlands and bogs, cove hardwoods, shale barrens, oak-hickory forest, oak-pine forest, northern hardwoods, grassy balds, boulder fields, and muskegs, ending in an alpine spruce-fir forest. Each community has plant and animal species especially adapted for survival.